Heavy haulage is one of the most skilled areas of haulage as attention to detail, health and safety and concentration levels are paramount in order to ensure a load reaches its destination. To carry out this type of work a top of the range fleet of trucks and trailers are needed to see the job through. To this end, not many can rival heavy haulage company Mar-Train Heavy Haulage Ltd, who have set high standards for the type of haulage. In recent years, Mar-Train have become the first heavy haulage company to have bases both in the north and south of Ireland. Their Northern base being established in 1979 by Sammy Martin, while two years ago, a depot was opened on the Docks Road in Limerick under the business name of Mar-Train Heavy Haulage Ireland Ltd. They provide their services throughout Ireland, the UK and Europe. Sammy’s son Tim and his wife Sonya have looked after the day to day running of the business for over 20 years now and they have continued the ethos of the elder Martin for hard work and customer satisfaction, which has stood them in good stead over the years. This year was another first for the company as they became the first haulage firm in Ireland to own the new Mercedes Benz Actros SLT. The SLT is larger, longer, tougher and stronger that any of its predecessors. It is an 8x4 tractor unit which has been systematically designed and built for heavy haulage enabling it to carry up to 250 tonnes. This new model has set new benchmarks in comfort, vehicle performance and flexibility and it brings heavy haulage into a new dimension, while the cab alone delivers the living and working comfort needed by heavy haulage drivers. “We are delighted with the new truck. It is an Actros SLT 4163 GigaSpace 8x4 tractor unit which has the Style-Line interior design equipped with driver and co-driver ventilated suspension seats, auxiliary hot water heater, luxury bed top and bottom and leather steering wheel,” said Tim. 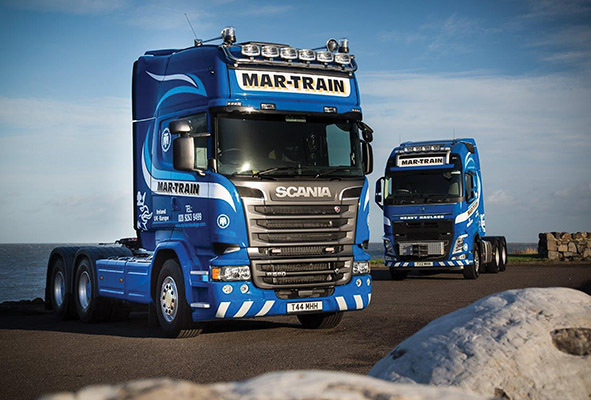 Mar-Train operate a fleet of 22 trucks between their two depots with Scania, Volvo, Mercedes and DAF making up the fleet. The company has maintained and indeed extended its customer base over the years with the latest addition to the client list being the McAvoy Group. There is a great emphasis placed on maintenance and ensuring that the fleet is kept in pristine condition at all times. Carrying such extreme loads means that a great deal of attention has to be given to the health and safety of not only the drivers but other road users and the load itself. Tim added that no two jobs were the same, so different approaches have to be taken for each of them.